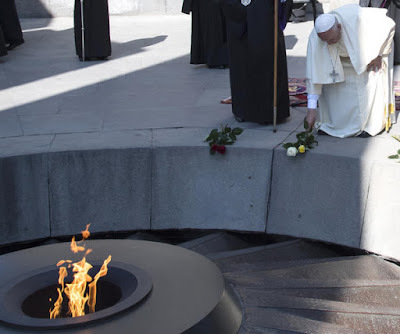 Whispers in the Loggia: In Armenia, The Pope's Prayer: "May Our Communion Be Complete"
In Armenia, The Pope's Prayer: "May Our Communion Be Complete"
Amid what's arguably been the most under-covered PopeTrip of recent times – all the more given the usual hysteria surrounding this pontificate – Francis' weekend trek to Armenia hasn't lacked for striking moments and, indeed, a pocket of controversy in the Pope's unscripted use of the charged word "genocide" in his remarks to the country's leadership: a move which, to the surprise of no one, set off another round of tension with the Turkish government. 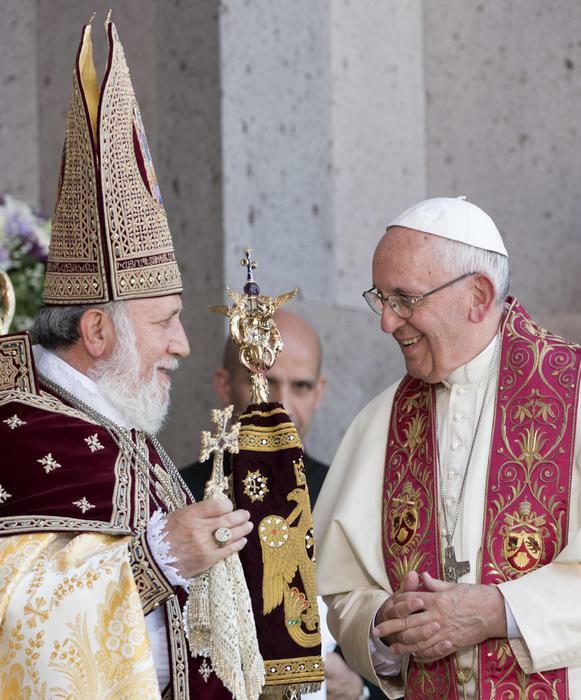 All that said, however, the visit's core emphasis came earlier today as Papa Bergoglio attended a Divine Liturgy of the country's Oriental Orthodox Church in its home-base at Etchmiadzin, celebrated by the Catholicos (Patriarch) Karekin II. Once his 14th overseas trek enters the books this evening – finished off as ever with another in-flight press conference (its content likely to drop around 10pm Rome/4pm ET) – Francis returns to Rome for an eerily quiet wrap-up to the "Vatican year," culminating in Wednesday's celebrations of the solemnity of Saints Peter and Paul. For the first time since 1984 – when St John Paul II began the practice of summoning the world's new metropolitans to bestow the pallium on 29 June – Peter's successor won't be flanked by the freshly-named archbishops on the feast, culminating Francis' desire for the insignia's conferral to take place in the respective local churches. As with last year's rites – when, due to already arranged pilgrimages from some spots, the archbishops were invited one last time – the Pope will bless the lambswool bands at Wednesday's morning Mass, after which they'll be sent to the world's Nuncios, who now impose the pallia on the new archbishops in their cathedrals. In the US, the newly-arrived Archbishop Christophe Pierre will have just one to give: the pallium for Archbishop Bernie Hebda in the Twin Cities, its conferral date at St Paul yet undetermined. In addition to the feast, meanwhile, the 29th likewise brings the 65th anniversary of Benedict XVI's priestly ordination. While a non-liturgical celebration of the Pope-emeritus' milestone is scheduled to take place in the Apostolic Palace this week, it's likewise expected that Papa Ratzinger will be present in the Basilica for the liturgy, possibly as a concelebrant for just the second time since his resignation. While the end of year likewise brings a batch of the annual plenary meetings for the Curial dicasteries and other final business before the summer exodus, barring any surprises – and there might just be some – attention's already turned to two matters for the next term: Francis' still-pending choice of leadership for the new mega-Office for Laity, Family and Life, which will consolidate two Pontifical Councils on September 1st, and the shape of the next intake into the College of Cardinals, with a Consistory widely expected to be called either late in the Fall or early next year. By November's end, the voting College will be at least 13 members shy of the maximum 120, and given Francis' practice of anticipating future vacancies, his third crop of scarlet could see some 20 electoral red hats doled out – a figure which would give Bergoglio's picks just shy of a majority of the voters in a hypothetical Conclave. Though the possibilities of the Pope's precedent-shattering penchant for the peripheries are fairly endless, with the US having been shut out of back-to-back Consistories for the first time in four decades, and the second-largest voting bloc now reduced to a modern low of seven members – a drop of four in two years – the Stateside element of the mix bears particular watching. Maintaining his usual practice of "staycationing" at the Domus, the Pope's morning homilies will again be on hiatus in July and August, with next month's trip to Poland for World Youth Day in Krakow the lone major event on tap. Yet while any last-round appointments are usually announced by July 15th, that might not be the case this year – at least, in one particular instance... and, well, more there in due course.